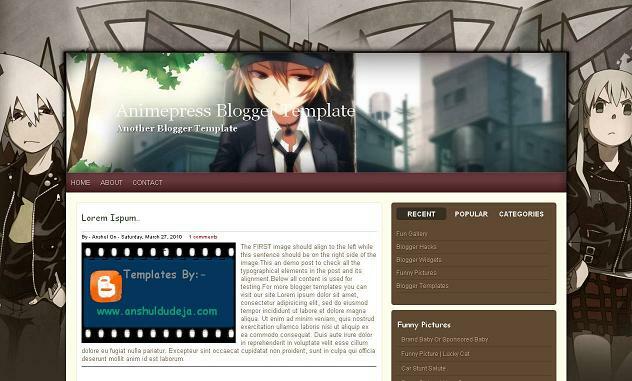 Animepress is a two column blogger template with sidebar to its right and post section to left.The theme is designed by web2feel and converted by me to blogger.The background image is attached to it fixed.The design is so rocking and it looks damn beautiful as have high quality colors and some images.Top menu links are ready for you.Seo for title has been done and it supports all blog features and is compatible with all browsers.Really to say i loved making this template.Surely you will like this.And special feature i have added three column tabber in sidebar which you will be going to love to use. Other blogger templates you may like are Florance and Rainboow. You will see tabber widget as below in sidebar. Now first click the Recent Button i.e recent text, then add a gadget you want to show there. 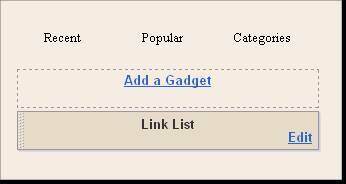 After adding just click on Popular text and add a gadget,whichever you want to add and similarly for categories text.Please remember do not add title to any widget you adding as they are defined in codes.So just keep the title blank of the widgets you adding. Now how to change the title text of widgets. Just go Blogger Layout > Edit Html > Press Ctrl+F and search for below codes in html. Now change them to title name of widgets you added for your blog. If still have problems can comment below.Enjoy this template. Is there a way for me to contact you via email? I would like to ask you some things if you do not mind?